Today's story is from Catharine Mi-Sook. I had the great honour to be invited to sketchnote my one of my favourite subjects, my love of Japanese stationery, by Mauro Toselli (@xlontrax) of Sketchnote Army. 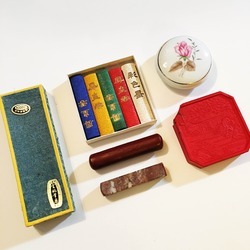 Though I am new to the wonderful sketchnote world and community at large, my story with Japanese stationery began at an early age thanks to my beautiful and talented mother, who was trained in classic Japanese watercolour arts in her upbringing in South Korea. After my first visit to South Korea and being gifted with Japanese and Korean stationery from my family there, my fascination only grew. To my chagrin, there was a bit of a lull in acquiring satisfactory Japanese paper and notebooks until I was introduced to the Midori Traveler's Notebook and Hobonichi Techo (with its magical Tomoe River paper) by Dr. Makayla Lewis (http://makaylalewis.co.uk), an incredible artist, sketchnoter, illustrator and collector of fine Japanese stationery. And colour came back into my creative world again. Since then, I have explored and discovered more wonderful Japanese stationery and art supplies, my favourites being from Hobonichi, Midori, Kuretake, Pentel, Tombow, Shinnippon Calendar Co., Copic, Mitsu-Bishi, Kitaboshi, and Itoya. Japanese stationery is not only about quality materials but there is something about the products and their very essence that is akin to a journey and story unfolding with each new step, each new page and brush stroke. A big thank you to Mauro for inviting me to share my adventure with Japanese stationery through my sketchnote and photos, and thank you all for being a community that encourages, builds and grows. Sketchnoters, I have found, are truly a special and creatively dynamic group, and I'm honoured and grateful to participate and be a part of such a beautiful community. Great pictures and useful informations!